For many of us in Australia, the amount of money that we spend on a meal or going out does not seem very much but in East Timor, it can keep a young girl in school for a year including all school fees, books and uniform. The 'Friends of Ermera', a community-based group of concerned citizens from the City of Casey, formed in 2002 with the aim of helping the people of Ermera rebuild their lives and communities. Their primary focus is the provision of education and training throughout the district and to respond to specific needs and priorities in Ermera. HAZCON is proud to support Friends of Ermera, by offering educational scholarships for five girls from underprivileged families and encouraging them to continue at school. When a young girl is awarded a scholarship in the first year, 'Friends of Ermera' make a commitment to fund her education for the full six years of secondary school. HAZCON sees education as the pathway to economic development and prosperity. 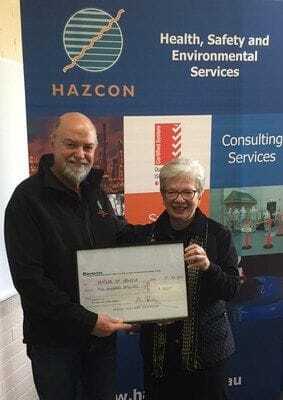 Marilyn Davidson from 'Friends of Ermera' receives a donation from Peter Attwood.